Perfectly cosy, this dish can be made in advance and left in the fridge for a couple of hours (or even frozen) until you're ready to bake. If you want to make it REALLY REALLY special add a handful of cooked lobster when stirring together then sprinkle with some truffle shavings just before serving. In a medium heavy bottomed pan melt the butter over a medium heat until bubbling, sprinkle in the flour and stir with a wooden spoon, slowly stir in the milk continue stirring the whole time, cook for about 5 minutes until it thickens. Stir in the mozzarella, cheddar, salt, pepper and nutmeg until completely melted. 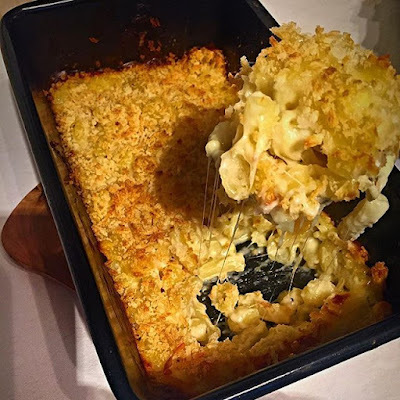 Cook the pasta as instructions on the packet, strain and pour into the cheese sauce, spoon into a large ovenproof dish, sprinkle with the breadcrumbs and bake for about 20 minutes. *We like the flavour of nutmeg in ours, but another alternative is a tsp of english mustard powder in with the white sauce.